← Free Screen Sharing Software: Yes or No? Twelve years ago a few close friends had a vision to develop easy to use software for streaming remote desktop over the Internet. Today, ISL Light is one of the most technologically advanced remote desktop software solutions letting you do everything from secure turbo desktop sharing, easy file transfer, video conferencing, live chat, session recording to remote printing, on your Windows, Mac or Linux computer, mobile or a tablet. During the past few days I’ve been busy adding pieces together of how ISL Light remote desktop software has evolved ever since its first release in 2003. Although that was the key year for ISL Light, the whole story began a few years earlier, in 1999, when a few close friends and Internet enthusiasts started digging into technologies that wheeled behind remote desktop control and founded a company in 2001, just a few weeks before the devastating 9/11 followed by a stock market downturn. Nevertheless, the start-up saw a big opportunity in remote desktop software since the market back then offered only a few similar solutions. Their first release was presented in 2003. First, in the local market and soon after their reach was extended to most European countries, the USA and Japan. Back to today, about 120,000 businesses from all over the world use a series of ISL Online remote desktop and online collaboration products on a daily basis either for remote support, remote access, live chat or online meetings. 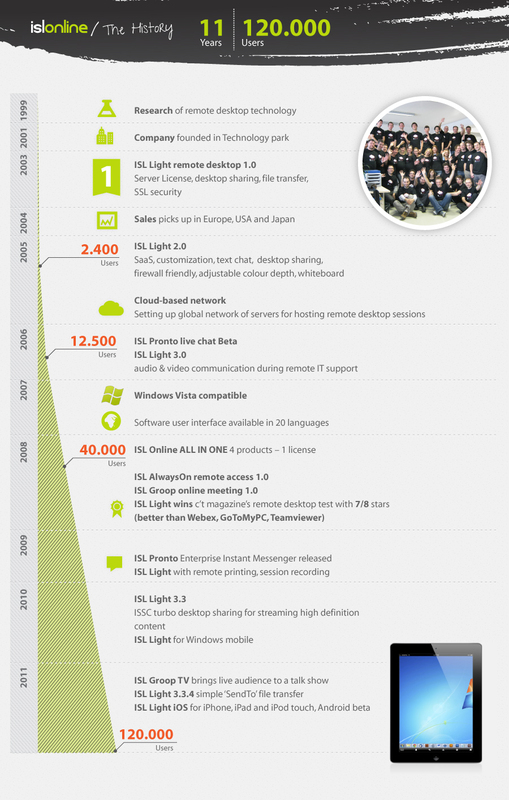 ISL Light started off as a one-way remote view & control plus file transfer service in 2003. It was secured by SSL encryption and was firewall friendly. As early as 2005, the version 2.0 brought two-way desktop sharing, more customisation options, text chat between the desk operator and the client as a sort of replacement for a telephone conversation during remote support, adjustable colour depth, which automatically adapted to the speed of the user’s Internet connection, and whiteboard tools for better visual communication between the connected parties. Most importantly, it also brought Software as a Service (SaaS). That was the key point in getting ISL Light across to a wider public since SaaS was a no-installation service hosted on ISL Online network of servers, offering pay as you go and an annual subscription. The number of users soon picked up from 2,400 before the 2.0 release to 12,500 in November 2006. Today, about 85% of 120,000 ISL Online business users go for the SaaS license. In the meantime, cloud computing technologies have been added to the SaaS’s network to ensure stability, fault tolerance and all-round availability of the service. GeoDNS, distributed session roaming, load balancing and other network technologies, offered exclusively by ISL Light, have been considered unique among similar products and are used even today as one of the core Cloud mechanisms hosting ISL Online’s SaaS. Using these technologies, the global network of ISL Online servers has reached unbeatable performance assuring that every remote desktop connection is strong and reliable, and works at optimal speed regardless of the user’s location. Today, the ISL Online Cloud consists of a series of dedicated servers, hosted by more than 50 professional and industry-proven data centres around the world. To get a rough idea of how big ISL Online SaaS’s Cloud Network actually is – in 2010 it hosted more than 5 million sessions with the heaviest of users creating over 250,000 sessions per year. ISL Online’s SaaS achieved an amazing 99.9667% uptime in 2010, meaning it was globally available 365/24/7 except for 2 hours and 55 minutes, mostly reserved for the scheduled cloud infrastructure maintenance. Considering global trends and a rising demand, ISL Online directed their efforts towards developing more software products for remote collaboration over the Web to fill in the gaps their increasingly popular remote desktop tool could not close. In March 2006, a new software programme ISL Pronto designed for live chat / enterprise instant messaging (EIM) was released as beta. In 2007, more new products followed – ISL AlwaysOn beta for easy remote access and ISL Groop beta for instant online meetings. 2008 was a milestone year. Soon after releasing the first official version of their remote access and online meeting software, a decision was made to bundle all four products into one called ISL Online and offer it under one license. One ISL Online licence enables users to subscribe to all four products: remote desktop support, remote access, live chat and web conferencing. The ISL Online’s move to All-in-One licensing was unique among online collaboration software providers and immediately shot them to the very top. C’t magazine for example, evaluated ISL Online’s remote desktop software as the best among 22 tested solutions. ISL Light scored better than WebEx, TeamViewer, Fastviewer, and much better than GoToMyPC, Netviewer and the rest. Meanwhile, the UK’s PC Pro magazine labelled ISL Online as the “only choice” for support operations. Up until now, ISL Light has been upgraded numerous times. The latest 3.3.4 version works on Windows, Mac and Linux and lets you do turbo desktop sharing, text chat, audio and video communication, easy file transfer via Windows Explorer’s “Send to” option, remote printing, session recording, multi-monitor support, remote reboot and reconnect, extended customisation, external authentication, branded access point, user management and various reports. It also uses 30 interface localisations. Mobile, mobile, mobile… reading the news, reviews and blogs on the Web, one can get a feeling that everything is in fact mobile nowadays. ISL Online, too, has gone mobile and one can download remote desktop free from the App Store and use it on iPhone, iPad and iPod touch. Windows Phone users can download remote access here. Now, it’s easy to imagine Android enthusiasts tapping their fingers on the table impatiently, so let me give you a hint: the word is out that ISL Online for Android is coming very soon…so, please stay tuned! This entry was posted in cloud computing, desktop sharing, internet communication, iOS, ISL Light, isl online, remote desktop, Uncategorized and tagged desktop sharing, evolution, infographic, online collaboration, remote desktop. Bookmark the permalink.